Victorious Europe Ryder Cup captain Ian Woosnam says he cannot understand why he is not in World Golf's Hall of Fame. Woosnam, 58, was overlooked for the 'Class of 2015' inductees, despite being a former world number one and winning the Masters in 1991. Former Ryder Cup captain Sam Torrance believes Woosnam should be inducted. 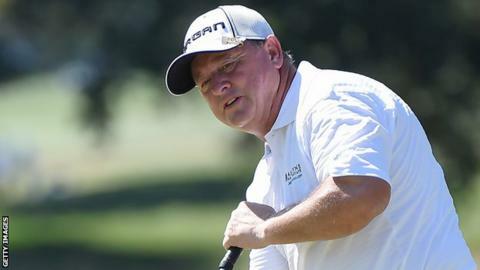 "I can't really understand why I'm not in there when there are other players in there who have not got the pedigree that I've got," Woosnam told BBC Sport. "But we will see what happens. What will be will be." Woosnam, who skippered Europe to Ryder Cup victory at The K Club in Ireland in 2006, celebrates 25 years since his Augusta win with a return to his favourite course this week. The Welshman will make his 28th appearance at the Masters on Thursday, teeing off at 16:27 BST in a group with American Troy Merritt and Byeong-Hun An of South Korea. The Masters is his only major title, yet fellow Ryder Cup captain Colin Montgomerie - who has not won a major or been world number one but did secure eight European Tour Orders of Merit - is already in the Hall of Fame. Woosnam, who is seventh in the all-time weeks at number one list after spending 50 weeks in the top spot between April 1991 and March 1992, has won 52 professional titles, more than 2015 inductees Mark O'Meara and David Graham, who have 34 and 38 victories respectively. He also has won a joint-European record 10 and a half four-ball points in eight Ryder Cup matches. Hall of Fame president Jack Peter said: "Ian has had a wonderful career and has received an overwhelming amount of support from media, fans and voters in our World Golf Hall of Fame induction process. "Based on Ian's career resume, he has and will continue will receive consideration for enshrinement." Hall of Fame membership provides entitlement to play the American Champions Tour.